With Logan Paul saying he wants a real UFC fight — here’s a reality check from one of the best in the game … YOU WILL LOSE! UFC welterweight champ Tyron Woodley says he’s been impressed with Logan’s training sessions as he gears up for his boxing match with KSI, but when it comes to UFC … Logan ain’t beating anyone. Remember, Logan says he wants to fight CM Punk — but Tyron says straight-up that ain’t gonna happen. 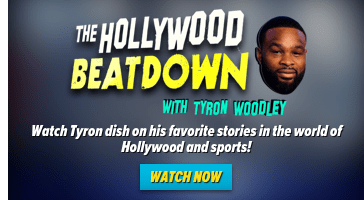 There’s a lot more on this week’s episode of ‘The Hollywood Beatdown‘ … including Tyron’s prediction in the Conor McGregor vs. Khabib Nurmagomedov fight! Tyron also updates us on his training camp for his fight against Darren Till at UFC 228 on Sept. 8 in Dallas. Check out ‘The Hollywood Beatdown’ every Friday on the TMZ Sports YouTube channel. Previous: Is Nikki Bella Still Having A Hard Time Getting Over John Cena?